In an Industrie 4.0 and IoT world, Ethernet is making inroads into process manufacturing. Specialized gateways simplify the transition and can create consistent, rapid and secure flow of information in both a horizontal and vertical direction. Performance is boosted and operators become significantly more flexible. HORIZONTAL AND VERTICAL INTEGRATION is one of the core principles behind Industrie 4.0. Achieving this requires standardized communication interfaces that are able to facilitate the interaction of a wide variety of components and the consistent flow of data. And the underlying standards are naturally demanding in terms of availability, usability, reliability, robustness and redundancy. Applications based on PROFIBUS DP are only able to meet a subset of these requirements. The number of devices is also limited - a barrier that is removed by PROFINET. Wireless communication bridges the gap between any production items and the IIoT. 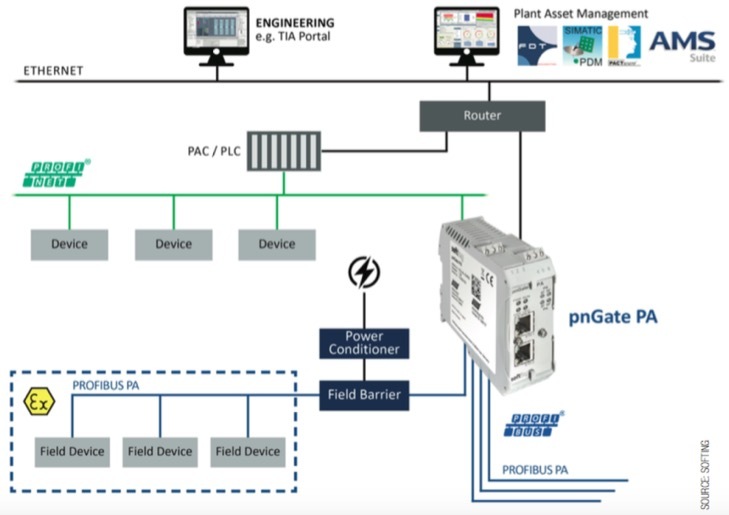 To make the transition as straightforward as possible, pnGate PA gateway technology enables direct PROFIBUS PA segment integration with PROFINET control systems. The gateway also acts as an interface between the host layer and field devices, along with handling PROFINET device and PROFIBUS PA master tasks. The pnGate PA unit also provides support for familiar tools for device configuration, parameterization and condition monitoring, including Siemens PDM, PROFINET engineering systems and DTM applications. Dirk Palme, Gateway Development Group Leader at Softing Industrial Automation said that: "Our customers also appreciate the fact that a technology upgrade can be completed in discrete stages. This option is especially relevant for complex, networked production equipment in process manufacturing, where operational reliability must continue to be assured despite ′open-heart surgery′ on the systems." This was also the approach taken by a leading manufacturer of paints and coatings, with the first step involving the use of pnGate PA (process automation) to migrate the existing PROFIBUS DP (decentralized periphery) network to PROFINET. Initial experience in using the new technology will be acquired in this pilot project. "The primary objective of this rollout was to enable greater flexibility at the control layer while reducing the large number of proprietary communication protocols," Palme continues. At the same time, project managers were looking to realize far higher transfer speeds and obtain a simplified set of options for parameterization - such as for condition monitoring, for example. Accordingly, Softing′s gateway offers support for key PROFINET engineering tools like TIA Portal, Step 7, and PC WORXS. pnGate PA is also likewise prepared for integration with standard engineering and plant asset management tools. 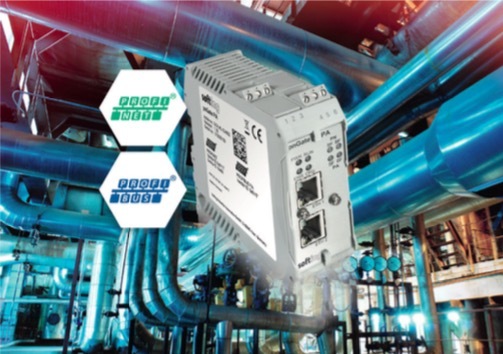 "With a solution like this, familiar tools can simply continue to be used, which makes the switch from PROFIBUS DP masters to PROFINET controllers easier and users aren′t suddenly confronted with a wide variety of fundamental differences," Palme said. No additional equipment is needed and cabling requirements are also fairly moderate. For this project, products from R. Stahl were used: series 9419 bus carriers and 9412 power supplies. In the current project, the Ethernet-based electrical cabling was already installed - only serial parts needed to be replaced. Accordingly, all plant components are networked via just one PROFIBUS cable that is used to transfer all process and diagnostic data. Engineering work is based on familiar tools such as with PROFIBUS. This avoids any need to acquire specialized expertise, which keeps retraining to a minimum. As a paints and coatings manufacturer, the customer also appreciated the fact that pnGate PA from Softing Industrial Automation offers full operational reliability with systems running in harsh industrial environments - where high levels of powder, dust and moisture are normal and where some areas are subject to explosion protection. As a result, some existing control cabinets are located directly next to production machinery while others are located in separate, protected server rooms. Migration work on the first plant was completed around two-and-a-half years ago and involved repurposing the existing fieldbuses. In this first stage, the Softing team installed two PA lines, each with six devices. The number has been successively increased since then to 30 PA devices on one gateway. Upcoming plans for expansion will see a substantial uptick in this figure. "With PROFIBUS applications, 125 devices usually marks the absolute limit," explains Palme. "After migration, a far higher number is now possible." Gateway enables direct integration of PROFIBUS segments with PROFINET. The resulting system architecture is now unified and the number of subscribers can be increased at any time as required. This not only ensures a consistent flow of data but also improves transfer speeds. Diagnostic work in terms of plant performance and individual components is now also more reliable. "One particularly pleasant surprise for customers during the migration was the comparatively low level of effort. Put simply: it was more or less a question of just removing the old couplers, installing the new gateway, and then connecting up the cables. That was really all there was to it," Palme added. Thanks to the PROFIBUS PA segment integration and the move from PROFIBUS DP to PROFINET, the plant operator now also enjoys greater operational reliability, which in turn translates into positive effects on costs. What is more, the pnGate PA gateway is a key part of the transformation towards designing processes compatible with the idea of Industrie 4.0. For requirements in this context, Softing Industrial Automation can offer a range of other digitalization solutions that it has also developed in-house: a MODBUS to PROFIBUS PA gateway for TCP control systems, and a MODBUS TCP to FOUNDATION Fieldbus H1 gateway, used to integrate FF devices into Modbus networks for process control and plant asset management. Softing also offers the mobiLink interface, an application for mobile devices that simplifies field device commissioning and maintenance. The interface supports the most important protocols for process automation (HART, FOUNDATION Fieldbus, and PROFIBUS PA), is compatible with FDT frame applications, and also has Zone 1 ATEX approval, which is prescribed for use in work environments that are explosion hazard areas. Thomas Hilz, Program Marketing Manager, and Dirk Palme, Gateway Development Group Leader, Softing Industrial Automation.